In Salqin, a small town in Syria’s northeastern governorate of Idlib, three members of the Islamist rebel group Ahrar al Sham are lying sick with a contagious fever characterized by an inflammation of the intestinal tract. The rural area near the Turkish border has seen a growing number of infections in recent weeks, Abdurrahman told IRIN. After two years of conflict in Syria, waterborne diseases are on the rise, compounding a growing humanitarian crisis. Typhoid, an infection caused by salmonella bacteria, has been reported, in addition to hepatitis A, a highly contagious viral liver disease. Infections are spreading due to a confluence of trends, said Elizabeth Hoff, representative of the World Health Organization (WHO) in Syria. For example, water pumps cannot be run because of the shortage of electricity and fuel. The resulting lack of drinking water is in addition to an almost complete breakdown of the sewage and the waste system in some regions, she said. Hence, people resort to drinking from rivers or wells that might be contaminated with faeces. To make matters worse, these risks of infection coincide with the collapse of the health system. According to WHO, more than half of all hospitals in Syria have been damaged; more than one third are out of service. Many doctors have left the embattled cities, and medication is often not available. WHO has registered 800 cases of hepatitis across Syria and 2,500 cases of typhoid in mostly rebel-held, northeastern Deir-er-Zor Governorate alone. In Apamea, a city of about 10,000 in Hama Governorate, Hasan Hamidi is one of only two doctors who remain. “Before the conflict started, I diagnosed four or five patients a year with hepatitis A,” he said. “Now, it’s four or five a day, most of them children.” When the clinic where Hamidi used to work was destroyed by shelling, he set up a small practice in a private house. However, lacking equipment and medical supplies, there is not much he can do to help his patients. Patients with mild cases usually recover, he said. In more severe cases, however, the situation often turns critical. "The current level of infections is an alarm bell for me"
Nearly 70,000 people have been killed since the uprising started in March 2011, according to the UN High Commissioner for Human Rights. As the conflict has escalated in recent months, living conditions have deteriorated drastically. According to an assessment by the UN Children’s Fund (UNICEF), the water supply available in the affected governorates has fallen to one third of the pre-crisis level. “The situation is concerning and in some areas, the shortage of water is serious,” said Iman Morooka, a UNICEF spokesperson in Syria. “For instance, in certain localities of Deir-er-Zor, water pumping [for drinking, cleaning, washing] has dropped by up to 90 percent,” a result of fighting, damage to the infrastructure, power cuts, lack of maintenance, and lack of fuel and electricity. The health risk due to lack of, or poor quality, water is particularly high for children, she told IRIN. The swelling numbers of displaced people, currently two million, are aggravating the problem, with many of them living in overcrowded shelters without access to basic sanitation. Even tap water has become a health hazard since the national production of water treatment chemicals has almost ceased. In some areas, the main water sources are controlled by the opposition, and so water authorities cannot even access the water source for testing and purification. 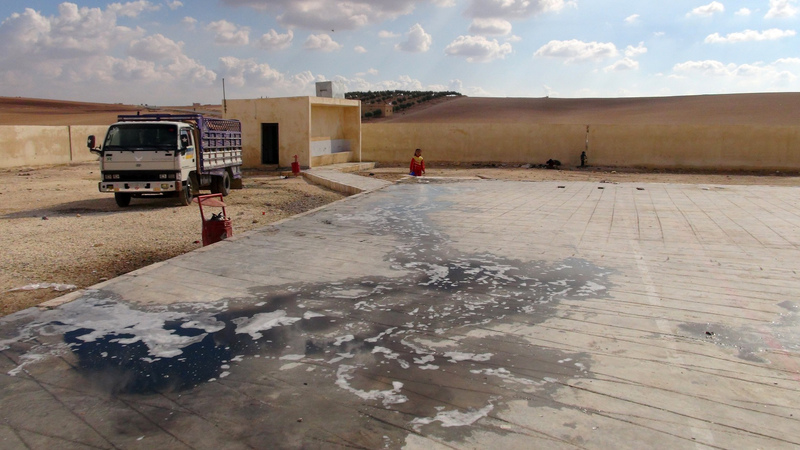 The International Committee of the Red Cross has been providing water treatment chemicals to governorates, and in some cases has trucked water into certain areas until more permanent solutions could be found. UNICEF is now “prioritizing interventions in the water and sanitation sector,” Morooka said. The agency has just started importing chlorine to provide safe water for 10 million people - almost half of Syria’s population. The figures for affected people are probably incomplete: due to lack of access, WHO has to rely on local NGOs for information. The data that is available suggests that Deir-er-Zor has been more affected than any other governorate. The diseases reported from there include leishmaniasis, a skin infection transmitted by a sand fly causing ulcers similar to leprosy. Amer said he recently visited a clinic because he was suffering from a rash. When he talked to the doctors, they told him they had seven new cases of leishmaniasis every day - in that clinic alone. According to WHO’s Hoff, leishmaniasis has been spreading as displaced people brought it to cities where the diseases had not occurred before. Moreover, she warned, the health risks might increase even more as soon as the weather gets warmer.